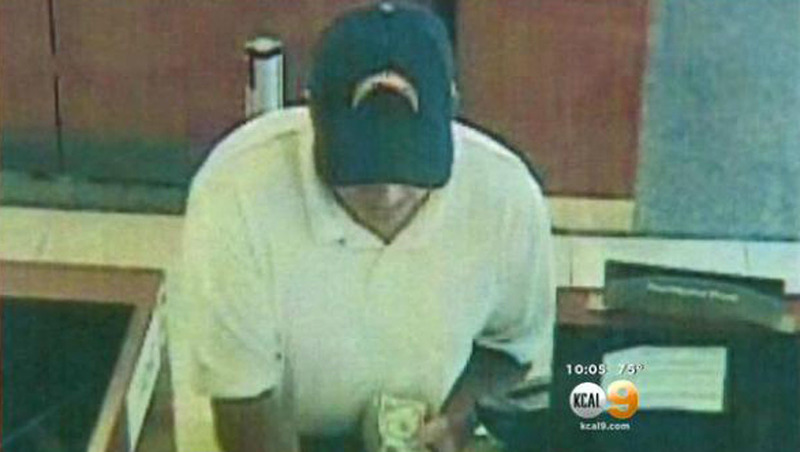 LAGUNA NIGUEL, Calif. - A suspected serial bank robber has struck again in Southern California, the ninth time in a year, reports CBS Los Angeles. Authorities said the most recent heist took place Monday around 3 p.m. at a U.S. Bank in Laguna Niguel, Orange County, just one hour after the male suspect reportedly tried to rob a bank in North San Diego. According to the station, the FBI has been tracking the man known as the "Hills Bandit" because he has continually targeted banks in the Laguna Hills area. "No matter what amount of money he gets, it's not enough," FBI agent Christopher Gicking told the station. "He'll keep going, so that concerns us." Gicking said the bandit takes time to plan out his heists. "He's got the area around the banks mapped out; he knows where he's going," he said. "That's what I believe he's from the South Orange County area or at least familiar also with the San Diego area, because he knows exactly where he's going." Investigators with the Orange County Sheriff's Department said the suspect has worn different baseball caps with various sports teams during the robberies. They suggested that it is only a matter of time before he strikes again. "We'd like to get him off the street before someone actually does get hurt," Gicking said. Banks are offering up to a $5,000 reward for information leading to the arrest and conviction of the Hills Bandit, according to the station.